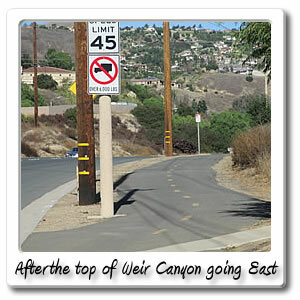 Welcome to Weir Canyon on the Santa Ana River bicycle trail. 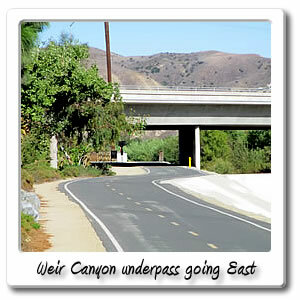 Right after the 23 mile marker, is the Weir Canyon Road/ Yorba Linda Boulevard entry point which is 23.1 miles, 1 hour and 57 minutes from the Pacific Ocean on the Santa Ana River Trail. 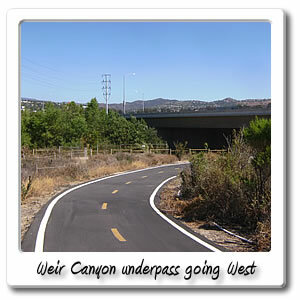 You are also 5.8 miles and 30 minutes from Green River Road, which is at the end of the Orange County section of the Santa Ana River Trail. 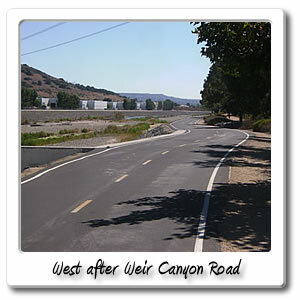 If arriving by car, there is no where in this area, to park, unless you go West to Fairmont Boulevard and La Palma Avenue, right after Yorba Park. 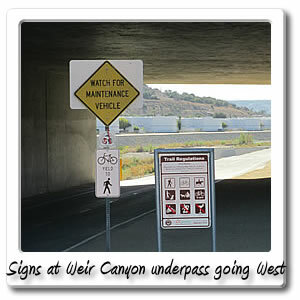 Another place for parking might be by going East right after Gypsum Canyon Road, where it goes into Featherly Regional Park, you make a right before the 91 freeway on ramp. 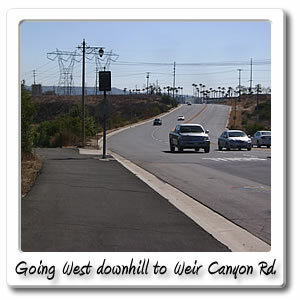 When getting off and going North on Yorba Linda Boulevard through the City of Yorba Linda, for about .2 miles for 26 seconds, you'll find a Lamppost Pizza, Albertson's, Jack in the Box, Ruby's Diner, Starbucks and other shops in the center. If you go through that same parking lot, in the middle, but off to the side, you can see a driveway leading out to a side street. If you take New River Road, South for .1 mile and then making a left or going East, on Esperanza Road for .1 mile and then making a left or going North on Eastside Circle for another .1 mile will take you to Eastside Community Park. If you continue going East and not making the left to go to Eastside Community Park. 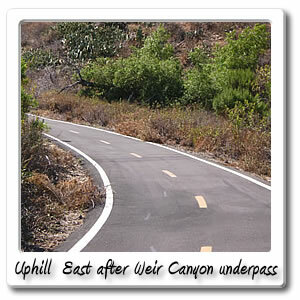 That will take you into the hills of the Hidden Hills Estates, as the street name turns into Hidden Hills Road. 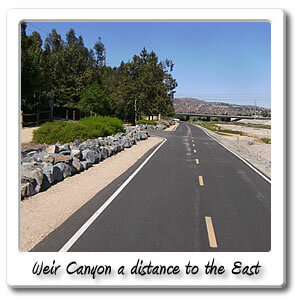 This is all within .8 miles and 8 minutes off of the Santa Ana River Trail. 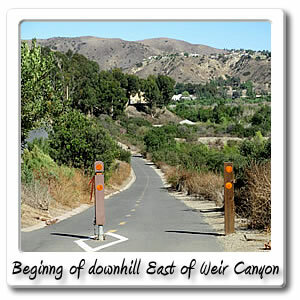 Located on 14.5 acres on top a hill overlooking La Palma Avenue, the 91 freeway, the Santa Ana River and even the Santa Ana River is Eastside Community Park located at 5400 Eastside Circle, in the City of Yorba Linda. 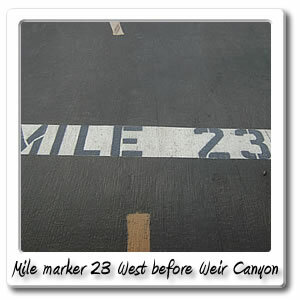 You can find two tennis courts that are lighted, along with two basketball courts. There's not much shade at this park, but a nice concrete path that goes around it. There is 143 parking spaces available in the parking lot here. At times even all those parking spaces might not be available if there are softball or baseball games going on at the one large baseball diamond or the two smaller ones, which all are lighted. Restrooms are also available, along with some picnic tables and grills, right around by one of the three different playgrounds in the park. If you go to the South part of the park and take a little trail, you can get to Jean Woodward Park, with has two smaller baseball diamonds. No parking is available here, and you can't find it unless you first go through Eastside Community Park first. If going South, to get to any close services, you will have to go South for .2 miles, then make a right onto Savi Ranch Parkway, right where you see Home Depot off to the side. 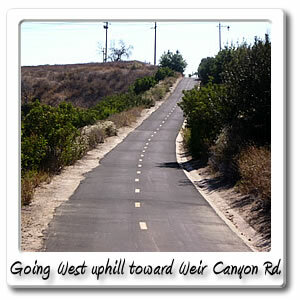 You then make a right onto Pullman Street, and follow it to the end, and then turn right onto Crystal Drive. 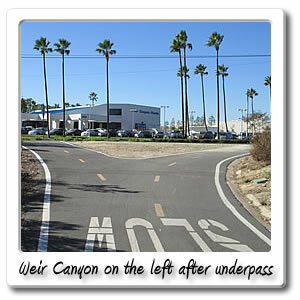 Then you go under the bridge, then you can see Costco. You can stop off for a slice of pizza and drink or a hot dog right in the front of Costco. You can continue going on Crystal and keep going straight where it will turn into Mirage Street. There you will find a Taco Bell, Chick-fil-A, McDonald's, and Denny's a little farther up. 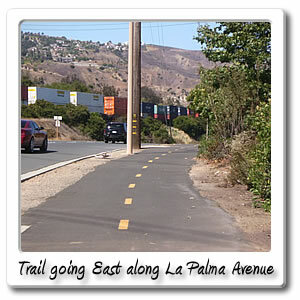 It's .8 miles off of the Santa Ana River Trail and 4 minutes if any of these establishment appeal to you. 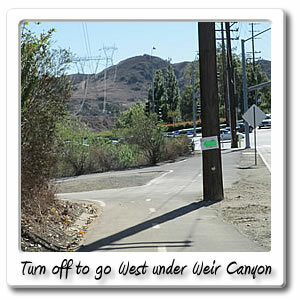 If you go South for .7 miles and 2 minutes, where the street name changes to Weir Canyon Road, as you approach Santa Ana Canyon Road, in the City of Anaheim. You can find a Burger King, Porky's Pizza, El Pollo Loco, Carl's Jr., and a City of Anaheim building that's the East Anaheim Community Center, which has a youth center, and Anaheim Police East substation on the side. In the same area, across the street from that in the Anaheim Hills Festival Shopping Center, you will find a Chevy's restaurant, grocery and department stores, some other restaurants, Starbucks and a 14 screen movie theater. Across the street from that you will find the East Anaheim Community Center, along with a youth center and the Anaheim Police substation by it. 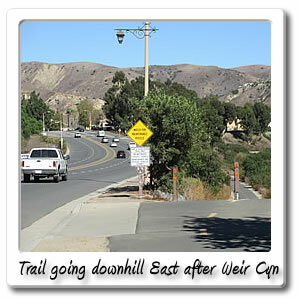 If you go West on the Santa Ana River Trail, the next entry/exit point will be Yorba Regional Park and at the end of that will be Fairmont Boulevard, that will take you North through the City of Yorba Linda. 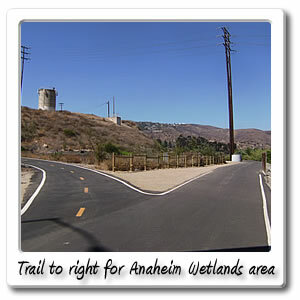 If you go East on the Santa Ana River Trail, you will go downhill and the Anaheim Wetlands, will be on the bottom to the right. 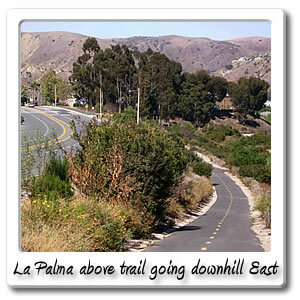 After you get to the top of the hill will be the Mercado Del Rio entry point, along with some places to eat.